UnLocal, Inc. will be holding a benefit art auction featuring 45 artists who have generously donated their work in support of legal representation for immigrants. UnLocal is a non-profit organization that provides direct immigration legal representation, legal consultations, and community education to New York City’s undocumented immigrant communities. UnLocal recognizes the needs of all immigrants, and tailors its programming to identify specific gaps in services that are not sufficiently provided elsewhere. BIDDING is online at unlocalartauction.org from Wed., Oct. 10th to the time of the auction event on Wed., Oct 17. All online bidding will close at 6PM on the 17th. Bidding will then be in-person or by phone only during the 6PM - 8PM silent auction event at the gallery. Framing Pooneh Maghazehe & William Corwin, Saturday, 13 October 2018, 5:30pm (free and open to the public), 17ESSEX. Join us for a screening and conversation with Verica Kovacevska and Lisa Sigal. The talk will center on Kovacevska's three recent projects. Titled Future Nomads, Master Plan (Children’s Edition), and The House We Grew Up In. Each work focuses on the polemics of gentrification from multiple perspectives—activist, futurist, and autobiographical. Together the artists will discuss the socio-political, historical, and personal traumas sustained by those affected by the urban planning policies that brought about the development. 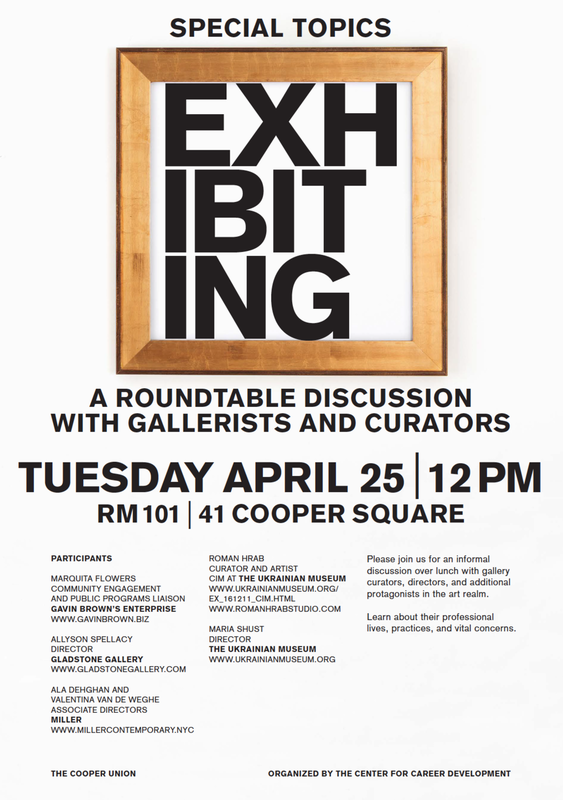 The event is organized by 17ESSEX in collaboration with Residency Unlimited. Kovacevska is currently an artist in residence from July through August 2018, where she is researching the rapid changes in her (temporary) Brooklyn neighborhood. Verica Kovacevska uses various media (performance, video, installation, new technologies) to research and interact with the public urban spaces. She often creates projects that are participatory in nature. In Master Plan (Children’s Edition), twenty children drew their proposals for the Kasernen-Areal, a former military complex in Zurich, which were submitted as proposals for the city’s forthcoming Master Plan. Their ideas not only highlighted the desire for a greener and more child-friendly environment in the city, but also advocated for the participation of children in the planning of land use. Future Nomads used the existing infrastructure on a construction site, a web camera mounted on a crane, to start a dialogue about artists and their place in the city. Twelve artists who would soon lose their studios to a new luxury development (Europaallee) held letters that read ‘future nomads’ in front of the live webcam. The work reflected on the process of gentrification and the increasingly nomadic existence of the contemporary artist today. Finally, The House We Grew Up In reflects on intimate childhood memories of Skopje‘s prefabricated architecture, as well as the changing face of the city as the prefabs make way for re-development. 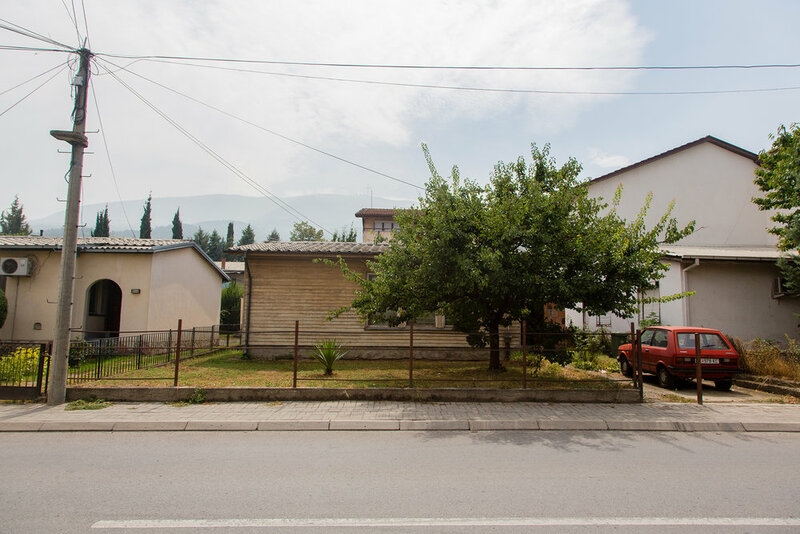 The work is the first of its kind to look into Skopje’s disappearing prefabricated homes, raising questions about their status and importance and more broadly the way that Skopje deals with its post-earthquake architectural heritage. Verica Kovacevska (b. 1982, Skopje, Macedonia) is a 2018 DENES / Young Visual Artist Awardee in Macedonia. She graduated in BA (Hons) Visual Arts with Theatre and Performance at the University of Plymouth in 2004, and achieved her MPhil in Arts, Culture and Education at the University of Cambridge in 2007. Since 2009 she lives and works in Zurich. In her work Kovacevska often uses elements of performance to create projects that are open to participation. She focuses on issues within the urban environment, from the use of personal space in public surroundings to more contemporary issues that plague our cities such as gentrification. She has taken part in many international exhibitions and festivals, such as Manifesta 11 (Zurich); Fourth Moscow Biennale of Contemporary Art (Moscow); 255 804 km2, Brot Kunsthalle (Vienna); Belgrade: Nonplaces, Museum of Contemporary Art (Belgrade); This Is Not A Gateway Festival (London); Re.act.feminism – Performance Art of the 1960’s and ‘70s Today, Akademie der Künste (Berlin). Among her solo exhibitions were Everyday Art, Art of the Everyday, Museum of Contemporary Art (Skopje) and Two and a Half Rooms, National Gallery of Macedonia (Skopje). Lisa Sigal is an artist, curator and activist based in Brooklyn. Her work has been exhibited nationally and internationally at The Whitney Museum's Biennial 2008, The New Museum, MoMa/PS1 Museum, The Sculpture Center, the Aldrich Contemporary Art Museum, The Albright Knox , the Brooklyn Museum, Prospect.3 International Biennial in New Orleans, the DeCordova Museum in Boston, the Essl Museum in Vienna, LAXART space in Los Angeles, Samson Projects in Boston, The Mattress Factory and the most recent iteration of the Anyang Public Art Project, Korea among other venues. As part of the Percent for Art program Sigal’s art will be permanently displayed by the MTA. Her work has been reviewed in Art in America, Artforum, Art News, Time Out and Modern Painters among other publications. Sigal is a 2015 Anonymous Was A Woman, grantee, 2012 Art Matters Foundation grantee and Creative Capital grantee, a 2011 Guggenheim Fellowship awardee, a 2002 NYFA grantee and received the Joan Mitchell Foundation Grant and the Elizabeth Foundation Grant in 1998. Sigal has been an artist-in-residence at the Joan Mitchell Center, the Skowhegan School of Art, the Headlands Center for the Arts, the Ballinglen Arts Foundation, Ireland, and the Sharpe Walentas Studio Program. She received a BFA from the Tyler School of Art in 1985 and an MFA from the Yale School of Art in 1989. Sigal is a founding artist/activist of Blights Out a coalition of people generating art, dialogue and action around the issues of blight, housing affordability and gentrification and in support of housing as a human right. Blights Out (www.blightsout.org) is an activist, artist, and architect and citizen collective in New Orleans, cofounded by Lisa Sigal, formed to fight housing injustice. Ala Younis is an artist, trained as an architect in Amman. Research forms a big part of her practice, as do curating, collaboration, film, and book projects. Her work has been exhibited at the Venice, Gwangju, and Istanbul biennials, the New Museum Triennial (New York), and the Home Works Forum (Beirut) among other places. Her projects include Tin Soldiers, An Index of Tensional and Unintentional Love of Land, Plan for Greater Baghdad, and most recently, Plan (fem.) for Greater Baghdad which opened at Delfina Foundation (London) and Art Jameel Project Space (Dubai) earlier this year, and will be on view at 17ESSEX in New York in April and May. Younis curated the first Kuwaiti Pavilion at the 55th Venice Biennale; and the Museum of Manufactured Response to Absence and its interventions in Algeria, Kuwait, and Ramallah. She is co-founder of the non-profit publishing initiative Kayfa ta. VIDEO: e-flux lectures: Ala Younis, “The Works Were Limited: Baghdad and Her Architects"
with Julia’s reading of To The Light House by Virginia Woolf. Time Passes, Julia Bland & Noah Garabedian on loom and bass, with Julia’s reading of To The Light House by Virginia Woolf. In collaboration with Know Wave. Join us for an evening of reading and cooking by Julia Bland, in conjunction with her solo exhibition Things To Say At Night. Julia will be serving her home-made soup and reading "Part II: Time Passes" from Virginia Wolf's To The Light House. Things To Say At Night is a solo exhibition of new works by Julia Bland organized by MILLER in collaboration with Stellar Projects. The exhibition is on view until October 29th. Image: Spine; Wicked Listen; The Kettle Black (detail), 2017, 25 x 60 x 3 inches, Burnt canvas, linen threads, denim, ink, oil paint. Courtesy the artist and MILLER. On the occasion of the final weeks of her solo exhibition at MILLER, Kristen Jensen will stage a partially scripted, partially improvised movement conceived specifically for the space of the gallery. 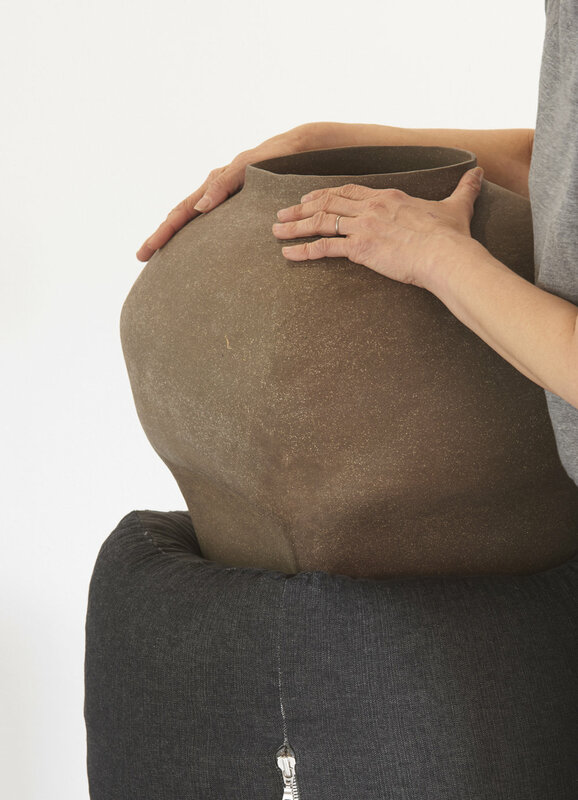 Seeking to expand on the performative aspect of the exhibition, Jensen will enter and then leave the gallery at an intentionally slow pace while awkwardly handling her sculpture, Weighty Ornament llI, treating it as both an inanimate vessel and another living body. While some movements will be predetermined, others will unfold spontaneously as a result of the growing discomfort of this absurd exercise in duration. Lighter, Later is on view at MILLER through Sunday, July 30th. Kristen Jensen / "Lighter, Later"
Been keeping my hands busy, occupied: it helps to dull my thoughts. I’ve never owned a rug, rather preferring to feel the uneven floorboards beneath my calloused feet. I usually fall asleep in the clothing I’ve worn all day then change in the morning. It’s not because I’m too fatigued but because I feel more comfortable shrouded than naked. I prefer a well worn pillow with a freshly laundered case. "Lighter, Later", a black hole, hand braided rug with embedded ceramic objects. These nuggets bound by material from used clothing, a collection of disparate use and histories. A personal meditation on compromised comfort, both physical and mental. 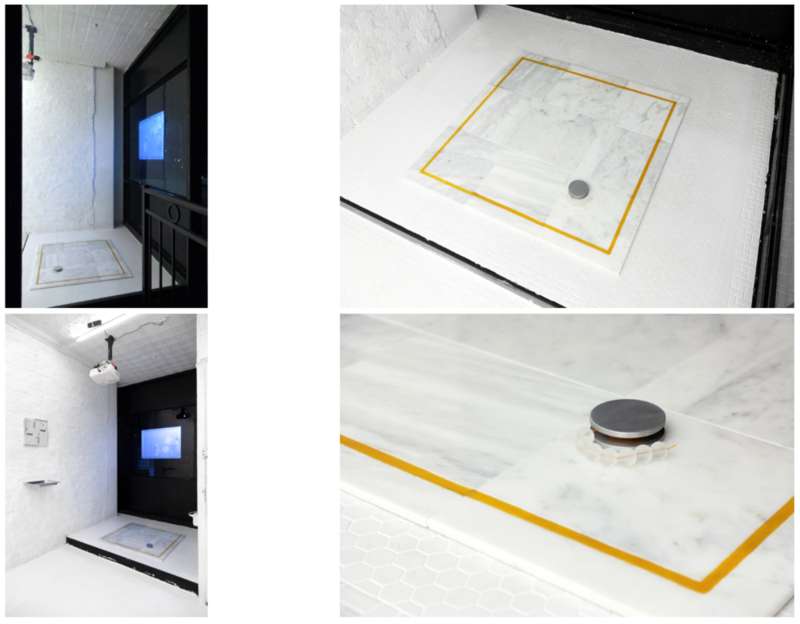 Viewers are invited to walk on it, resulting in this transference of experience both emotional and physical. Observing this activity from the window vantage point is another sculpture: a ceramic vessel with questionable functionality barely supported by a soft totem. Both spectator and participant in this production, it struggles to remain upright. Kristen Jensen is an artist living and working in New York City. She received her BFA in printmaking from Syracuse University and her MFA from Hunter College in Combined Media. Jensen's practice is interdisciplinary, often taking quotidian experiences and domestic objects and reinterpreting them in diverse mediums. The artist’s desire for control and perfection is often challenged by both the unpredictability of the materials she chooses and the traces of the artist’s hand. This tension is reflected in the flaws, cracks, and subtle finishes that transform everyday objects into things both pathetic and poetic. She has exhibited domestically and internationally at Simone Subal, Wallspace, Nicelle Beauchene, Norte Maar and Bortolami Gallery among others. Image detail: Kristen Jensen, "Weighty Ornament lll", 2017, (detail). Courtesy of MILLER and the artist. Please join us for a closing reception and conversation with artist Adelita Husni-Bey and Vera List Center for Art and Politics Curator, Amanda Parmer, on deferred notions of community, radical pedagogy, habitability, the question of origin and a trip to Mars. Amanda Parmer's writing, archival and curatorial work focuses on developing community through pedagogy and our elected affinities. She was a 2009-10 Whitney Independent Study Program Helena Rubenstein Curatorial Fellow and is currently the Curator at the Vera List Center for Art and Politics and co-curator of Maria Thereza Alves' Seeds of Change: Botany and Colonization. She has presented exhibitions, programs and events in collaboration with e-flux, the New School, The New York Armory and Volta Shows, The Kitchen, and Cleopatra's, Brooklyn and Berlin. She has most recently published "Yoko Ono Shaking the Sign" for the Henie Onstad Kunstcenter's A Pendaflex, "Tunisian-Lampedusian Migrants as Commodities" for The Ocean After Nature organized by Independent Curators International; "Our Human Entanglements with Corporeal and Terrestrial Grounds" for Marie Kølbæk Iversen's If the Earth Were a Body Borders Would be Wounds; and "Interval" for the Dictionary of the Possible. In 2014 she initiated Parmer, a curatorial project looking at matrilineal relations that has taken place at 464 Quincy, Abrons Arts Center and Sunview Luncheonet. Image detail: video still, 2265, 2 channel video installation, HD video, color, sound, 2015. Courtesy MILLER, New York and Galleria Laveronica, Modica. Please join us for a catalogue release and conversation with artist Leeza Meksin and art critic Benjamin Sutton, in conjunction with her exhibition / site-specific installation Purse Strings and Body Bags. The exhibition has been extended until April 2nd. LEEZA MEKSIN is a New-York based interdisciplinary artist. Born in the former Soviet Union, she immigrated to the United States with her family in 1989. Meksin has created site-specific installations at The Utah Museum of Contemporary Art in Salt Lake City (2016), The Kitchen, NYC (2015), BRIC Media Arts, Brooklyn (2015), Brandeis University, Waltham (2014), and in a National Endowment for the Arts funded project at Artspace, New Haven, CT (2012). Meksin’s work has been featured in BOMB magazine, TimeOut Chicago and Chicago Tribune, among others. She is the recipient of the Rema Hort Mann Foundation Emerging Artist grant (2015) and the co-founder and director of Ortega y Gasset Projects, an artist-run gallery in Brooklyn, NY, founded in 2013. Meksin has been teaching at Columbia University School of the Arts since 2015. BENJAMIN SUTTON is an art critic, journalist, and curator who lives in Brooklyn. His articles on public art, artist documentaries, the tedium of art fairs, and other divisive issues have appeared on Hyperallergic (where he is the news editor) as well as in The L Magazine, Modern Painters, Art+Auction, artnet News, BKLYNR, and Brooklyn Magazine. He has curated exhibitions at the Lower East Side Printshop, Field Projects, the Spring Break Art Show, and the Gowanus Loft. Image detail: Leeza Meksin, Purse Strings and Body Bags, Site-Specific installation at MILLER, 2017. 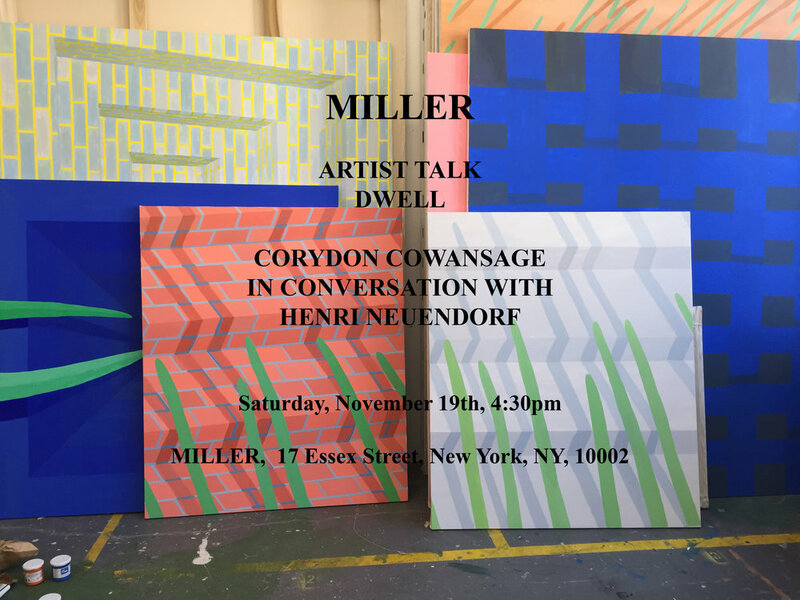 Please join us for an artist talk with Corydon Cowansage, moderated by writer Henri Neuendorf, in conjunction with her exhibition Dwell. The exhibition has been extended until November 27th. The paintings presented in Dwell explore the psychology of space and the relationships between the built environment, landscape, and abstraction. Using repeating forms like blades of grass, roof shingles, bricks, and leaves, she makes optical, meditative abstractions that creep into representation. Forms also reference the body—bricks are fleshy, leaves have veins, grass stands in for hair or fingers, and dirt becomes skin. Shapes almost touch, poke, rub. Corydon Cowansage (b. 1985, Philadelphia) received her MFA in painting from RISD and BA in art from Vassar College. She has participated in residencies at the Bronx Museum of the Arts and the Yale Norfolk School of Art. Her paintings have been exhibited most recently at Deli Projects (Basel, Switzerland), The Bronx Museum of the Arts (Bronx, NY), James Graham & Sons (New York, NY), harbor (Brooklyn and New York, NY), and projekt722 (Brooklyn, NY). She lives and works in New York. Henri Neuendorf is a journalist and critic specializing in contemporary art. Neuendorf is an associate editor at artnet News. 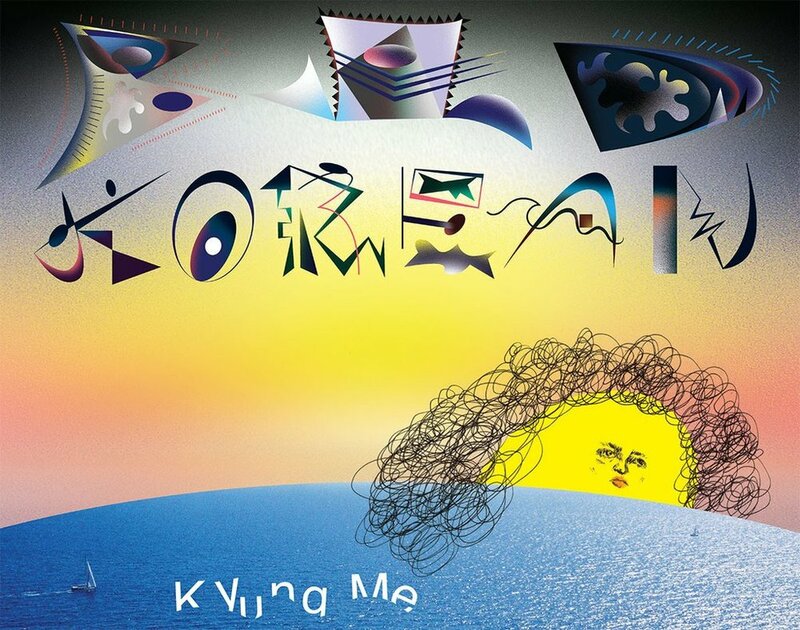 Please join us for the book signing of Kyung Me's Bad Korean at MILLER. Kyung Me (b. 1991) is currently enrolled in MFA Painting at Yale University. The Bad Korean series was published into a book earlier this year.